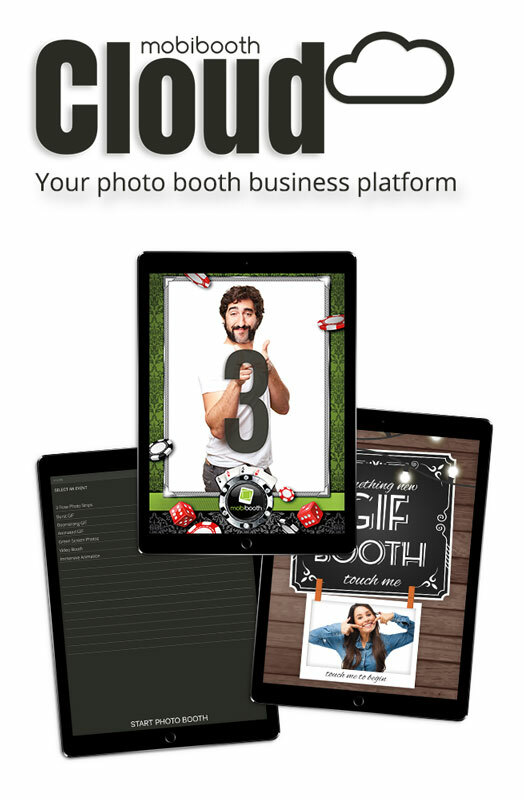 Mobibooth Cloud™ is a powerful photo booth software platform that brings professional quality to iPad base systems. The platform consists of an easy to use iPad app and a powerful cloud based management system. The system has been built from the ground up with rapid deployment in mind. The platform is capable of high quality photos, animated GIFs, video booth, burst boomerangs, chroma key (green screen), multiframe animations, social sharing, texting, email and printing. All the features you'd expect from a modern photo booth with the ease of an intuitive web interface and iOS app. If you have been considering an iPad photo kiosk system the combination of Mobibooth Cloud™ and the Mobibooth photo kiosks are the only tools you'll need. Our professional hardware, powerful software and world-class support will ensure you succeed! The iPad app has been designed to make it easy for both employees and brand ambassadors to quickly learn and use. Your team will be able to use the app in a real life situation in just a couple minutes. The cloud based management portal is where the real work gets done planning. It has been design to make creating, deploying, monitoring and reporting photo events anywhere in the world easy. Step by step wizards make creating events intuitive and fun. Colorful dashboards make monitoring and reporting event metrics a breeze. 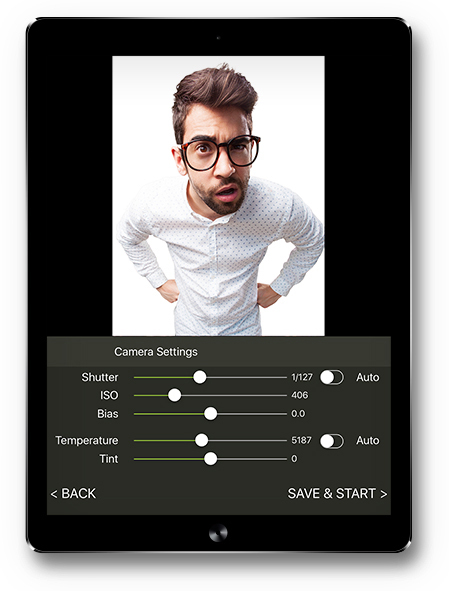 Capture full resolution photos with full camera controls. Dial in the perfect setting and capture gorgeous photos in full resolution. Create a video booth and capture short videos. Allow guests to leave messages for the bride and groom or testimonies for your brand. Control the camera shutter speed, ISO, white balance and more. It has never been easier to dial in your booth for that perfect exposure. Powerful cloud management to create, deploy and report everything about your events. Manage one to hundreds of photo booths anywhere, anytime. Capture the fun of forever looping high speed boomerangs with sharp images free of motion blur. Use predefined layouts or customize it to your liking. Create immersive photos with the magic of chroma key. Support for unique backgrounds per photo or immersive GIFs putting the subject right in the scene. Allow guests to send their photos via text, email, Facebook, Twitter and more. Configure all aspects of the sharing experience from messaging to available methods. Easy to read reports that highlight key metrics and KPI's for your events. See photos taken, social media shares and their effective impressions. Keep up with updates, new features and availability by subscribing to our newsletter. 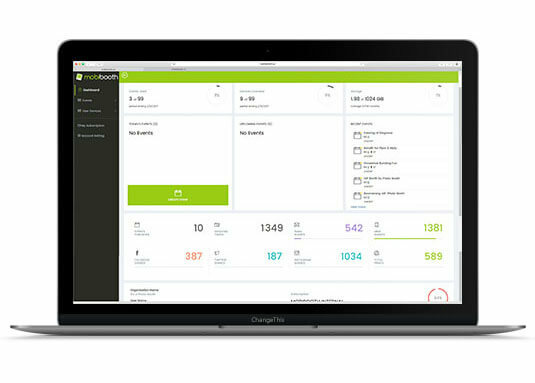 The Mobibooth Cloud™ features a powerful cloud based management portal. You can easily manage one to hundreds of photo booths located anywhere in the world from your computer, tablet or phone. Powerful dashboard gives you the information and the tools to do what you need. Quickly identify create new events using intuitive wizards. Edit and distribute changes effortlessly with a few clicks. Produce reports for clicks quickly. Download event galleries with one click. Manage devices anywhere in the world. Manage your subscription based on needs. Gone are the days of motion blur when using iPad photo booths. With Mobibooth Cloud™ you have full control over the camera allowing you to produce photos that looks as sharp as competitive DSLR based photo booths. Shutter speed. This allows you to speed up the capture to prevent that dreaded motion blur. ISO speed. Increasing will allow for better exposure in dark venues. White balance color temperature. Photos look a little cold? Warm them by adjusting this setting. White balance tint. Competition looking green? You can correct this in the photo (their envy we cannot help). Photo capture speed (125ms and up). Number of photos to capture. Camera mode including standard, DSLR & square. Custom background image or color. 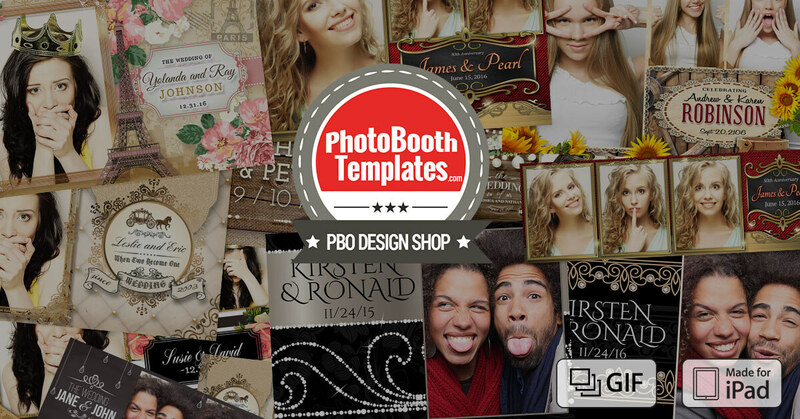 Mobibooth Cloud™ subscribers enjoy 20% off all template purchases from the industry's #1 source for professional templates the PBO Design Shop. With camera mode simulation subscribers can make use of their full catalog with DSLR simulation. All template layouts, photo dimensions and coordinates, are available in the event creation wizard for one-click programming. It has never been so easy to look so good with your photo booth! Sign up today and take advantage. Below you will find the pricing for our four standard tiers. We have structured these to help you get your new iPad photo booth business started in a cost effective manner. As your business grows and your monthly events do to our tiers allow us to scale up with you. 1 the number of events per billing cycle. These events can be used by all licensed devices. Mobibooth Cloud™ is available to all of our photo booth owners. The app can be downloaded from the Apple App Store for free and tested without creating an account.